From left, Rep. Devin Nunes, President Trump, and FBI Director Christopher Wray. VietPress USA (Feb. 2nd, 2018): On Feb. 1st, VietPress USA published news from the White House to confirm that President Donald Trump will allow to release on Friday the Classified Memo that purports to show improper use of surveillance by the FBI and the Justice Department in the Russia investigation (https://www.vietpressusa.us/2018/02/white-house-president-trump-will_1.html). The four-page Memo was written by Republicans of the House Intelligence Committee, led by Chairman Rep. Devin Nunes (R=Cal. ), a close Trump ally who has become a fierce critic of the FBI and the Justice Department to protect Trump from the Russia meddling in 2016 Election. FBI declares that the Memo is a lie and that is "Grave Concerns" and that FBI "condemns White House to make Memo public". Democrats called it a selectively edited group of GOP talking points that attempt to distract from the committee's own investigation into Russian meddling. Today, President Donald Trump official authorized the release of a controversial memo that reportedly accuses the FBI of abusing its surveillance powers in its investigation into whether Trump’s presidential campaign colluded in Russian election meddling. The House Intelligence Committee released on Friday the controversial memo, prepared by GOP chairman Devin Nunes, alleging surveillance abuses by the FBI and the Department of Justice. 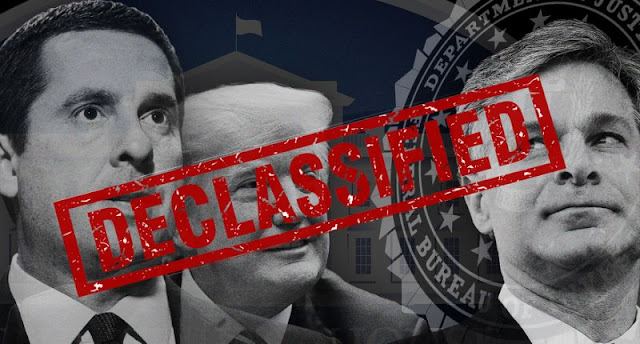 President Trump declassified the four-page memo and authorized its release, ignoring warnings from current and former FBI and DOJ officials and numerous lawmakers who said doing so would be reckless and dangerous. Below is the full memo as well as the letter from the White House authorizing its release.